Tassel earrings have been making waves this season as the accessory to have and dangle in and why not, especially when they are of diamond rubies and emeralds! We love a fashionable sway here at PHERES and our gorgeous tassel beauties have been adorned by stars for red carpet events regularly! 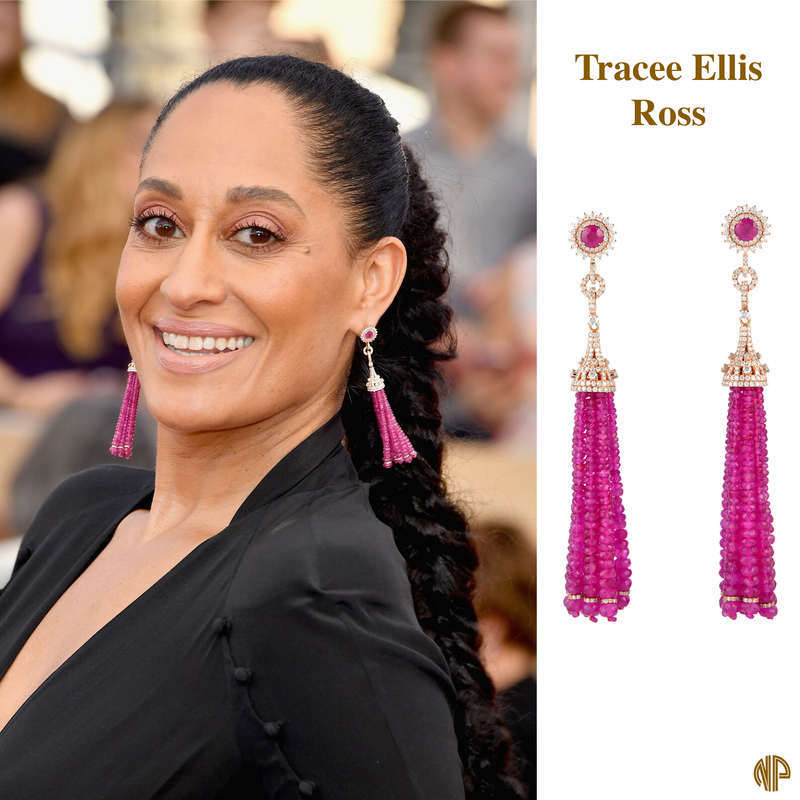 Tracee Ellis Ross at the SAG Awards 2017 wearing Narcisa Pheres ruby tassel earrings. For that extra oomph, statement earrings like our glam diamond ruby earrings worn by Tracee Ellis Ross or earthy toned emerald earrings as seen on Noureen De Wulf and Luciana Damon is perfect to complete a look! Luciana Damon (L) at the 74th Venice Film Festival & Noureen De Wulf at Sports Illustrated Fasionable 50 event sparkling in Narcisa Pheres emerald tassel earrings. *Style Tip: Hair up or down, tassel earrings make a powerful statement, regardless. Make sure to size the tassels to your facial structure and neck length – you don’t want the tassels to overwhelm your flawless face! Pop Sugar, People Magazine, US Weekly, Daily Mail, Just Jared, WWD approved! Tassels are here to stay and this is one trend we don’t see turning passé , so why not go a little out of the customary way to add a new added bling to your vanity!